Angeline Brown, more famously known as Angie Dickinson, is an American actress with six decades of acting to her name. She is most popular for opening the doors for women to receive leading and titular roles in television thanks to her stint as the lead role in the series Police Woman. Angie Dickinson’s acting career is decorated with three prestigious Emmy Awards nominations. She is also the holder of two Golden Globe Awards and a Saturn Award. In 1987, she received a Star on the Hollywood Walk of Fame and in 1989 she received a Golden Boot Award. The famous actress was born on the 30th of September, 1931 in Kulm, North Dakota. She was the second daughter (out of four daughters) of parents Leo Henry Brown and Fredericka (née Hehr). She was born Angeline Brown, but the name Angie became more widely used by her family and friends. Her father Leo worked on Kulm Messenger and Edgeley Mail as a newspaper publisher and editor. Angie Dickinson was raised Roman Catholic, with German ancestry. Her love for movies was as a result of her father’s duties as the projectionist at the town’s sole movie theater before it was destroyed in a fire. When Angie Dickinson was 10 years old, her family moved to Burbank in California. Her high school education was at Bellarmine-Jefferson High School, where she graduated at the age of 15 in 1947. She went on to study at the Immaculate Heart College, Los Angeles, and Glendale Community College. While in school, she worked at Lockheed Air Terminal—now called Bob Hope Airport—as a secretary. She finished school as a business graduate in 1954. She wanted to follow in her father’s footsteps and become a writer, but fate had a different plan for her. Before she graduated in 1954, Angie Dickinson entered a beauty pageant in 1953, finishing second place. This exposure got her the attention of a TV producer, who beckoned her to consider becoming an actress. A few years after doing a bit of studying on acting, she was approached by NBC to appear as a guest star on several shows. Along the way, she met Frank Sinatra, and the two became very good friends. In 1960, she was cast as Sinatra’s wife in the movie Ocean’s Eleven. On the 31st of December 1954, Angie Dickinson made her television debut on an episode of the syndicated series Death Valley Days. This opened the door for Angie to receive roles in several other series; Matinee Theatre, City Detective, It’s a Great Life, Gray Ghost, Broken Arrow, Meet McGraw, The Virginian, and several others. From 1956 to 1958, she continued to get guest roles appearing in single episodes of different shows including Colt .45 and Perry Mason. She continued on with her guest appearances, creating memorable characters in such shows like Wagon Train and Men into Space. In 1964, she guest-starred alongside Rober Duvall in an episode of the series The Fugitive. The year 1965 saw her cast in the NBC series Dr. Kildare as Carol Tredman. She also got to star in two episodes of the Alfred Hitchcock Hour show: the first on the 18th of October, 1962; and the second on the 1st of February, 1965. Angie Dickinson’s breakthrough on the big screen was in the 1959 movie Rio Bravo, where she played a flirtatious gambler called Feathers. This shot her into mainstream roles, making her a prominent leading lady for movies in the decade. She got roles in The Bramble Bush (1960), A Fever in the Blood (1961), The Sins of Rachel Cade (1961), Rome Adventure (1962), Jessica (1962), Captain Newman, M.D (1963) and The Killers (1964). The Killers saw her act alongside future president Ronald Reagan in his last acting role. Angie Dickinson would continue to act in many other movies, receiving both leading and supporting roles in each one. She would later return to television series for the critically acclaimed anthology Police Story. 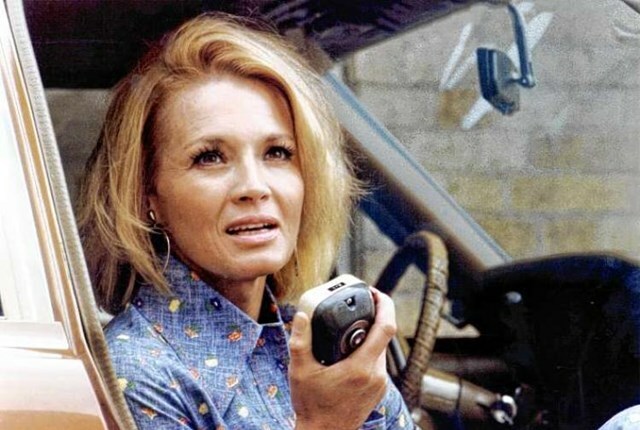 Her performance was so greatly received that NBC gave Angie Dickinson her own TV series Police Woman. It became the first ever successful TV series with a woman in the title role. She played the role of Sergeant Leann ‘Pepper’ Anderson, an officer of the Los Angeles Police Department’s Criminal Conspiracy Unit. The series reached number one in many countries chart during its first year, making it an instant hit. The series ran for four seasons from 1974–1978, earning Angie Dickinson a Golden Globe award and Emmy Award nominations three years in a row. Thanks to the success of Police Woman, women all over the US began applying for employment with the police force. Police Woman was proof that it was possible to have a successful TV series with a lead female role. Angie Dickinson got married to former footballer Gene Dickinson in 1952. The marriage was not a happy one, and in 1960 the couple had a divorce. She kept her married name though, and five years later got married to Burt Bacharach. For 15 years, they remained a couple but had a period of separation where they had relationships with other people. For several years in the 1990s, Angie Dickinson was in a relationship with TV interviewer Larry King. She had a daughter with Burt they called Lea Nikki, or more commonly known as Nikki. Nikki was born a year after her parents got married, but she was born three months premature. She suffered from visual impairment and other chronic health problems. She was later diagnosed with Asperger’s Syndrome. Angie Dickinson, at this point, began to reject acting roles so she could focus on the care of her daughter. Her father, Burt, wrote the song Nikki for his daughter. Angie and her husband had to place their daughter Nikki at the Wilson Center in Faribault, Minnesota so she could get professional care and treatment. She remained at the facility for nine years before going on to study geology at California Lutheran University. Sadly, her poor eyesight didn’t allow her to pursue her course as a career. On the 4th of January, 2007, at the age of 40 Lea Nikki committed suicide by suffocation in her Ventura County apartment. Angie Dickinson dedicated her life to American cinema, giving six decades of it appearing on both the small and big screen. That longtime career has been good to her, allowing her to be awarded several times over. It has also allowed her to rake in a whopping net worth estimated at $25 million.